Place space heaters on solid surfaces at least three feet away from flammable items. Always turn off space heat-ers before exiting a room or going to sleep. Don’t leave a fireplace unattended unless embers are extinguished. Use a fire screen to catch rolling logs or sparks. Generators should only be used in open and ventilated areas and should never be operated inside a home, including in a basement or garage, due to the risk of carbon monoxide fumes. Never connect generators directly to household wiring without first having a qualified electrician install a transfer switch to prevent backfeeding, which poses a serious threat to line workers. If using Sterno or charcoal to cook food, always do so outside in a well-ventilated area. Cooking indoors with Sterno or charcoal will produce deadly carbon-monoxide fumes, which are colorless and odorless. 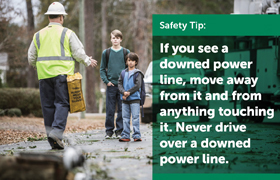 Stay away from downed or sagging power lines and don’t attempt to remove tree limbs from lines. Never drive over power lines and always assume they are electrified and dangerous. Alert your electric cooperative of any damaged lines immediately. Find more safety information on our website under the ENERGY CENTER tab.